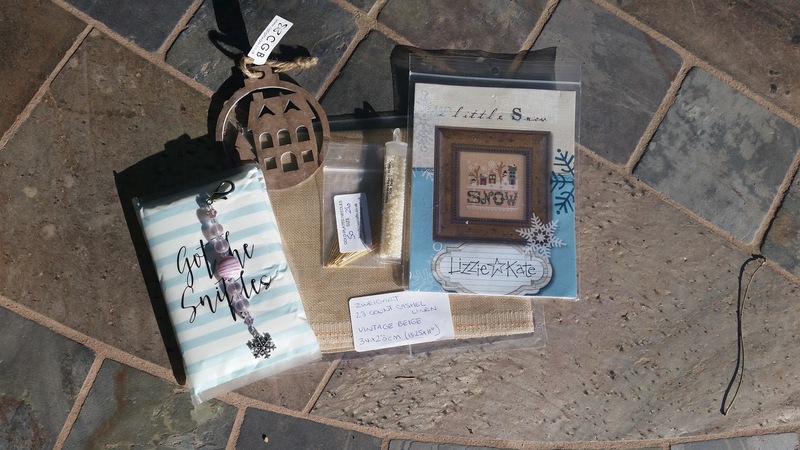 My HOE exchange piece arrived from Christina of Whilst Iris Naps just last night, and it is AMAZING! She did such lovely work finishing it, with the beaded trim around the outside, and the beaded hanger that matched the design so perfectly. This is a Shepherd's Bush design, call "Fa La La", and it is so cute. The grass along the bottom which is satin stitched, and then the cute lettering above the sheep. She did an awesome job on this. She also sent along some unexpected goodies. A LK kit called "Little Snow" which is very cute and now I want to stitch it right away (i'm not even going to open it though or I would start it and have to add another WIP to my list! 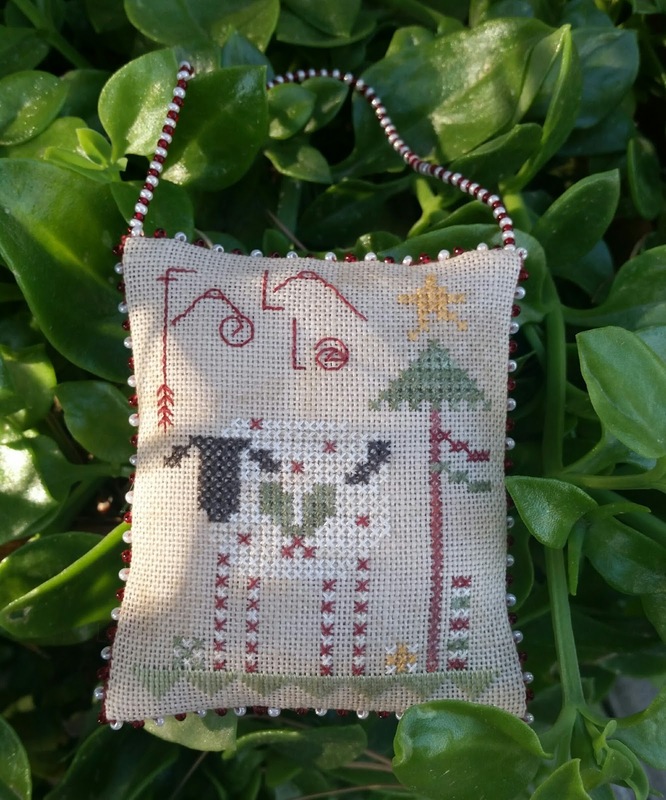 ), and a bit of 28 ct Zwiegart linen, and the prettiest little pink scissor fob with a tiny snowflake charm on the end, along with some beads and needles, and wow! Carol and Christina really made this exchange so fun. I hate to put both their ornaments away until Christmas time now! I am thinking of trying to organize maybe a spring or summer exchange on the HOE blog if anyone would be interested? 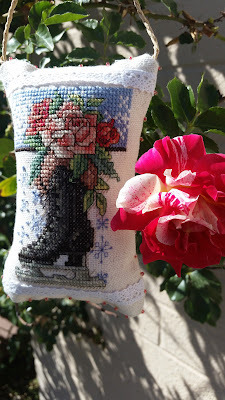 Here is what I stitched for Christina, it is part of the Winter Sampler which is a Janlynn kit. I loved the little ice-skate with the pretty pink roses in it. I added a little lace trim to the sides, and some little pink beads around the edge of it. Here is my progress on fickle fickle Ashley. I took her outside this morning to try and get a better photo of the linen color. Please excuse the wrinkles on her, I just wanted a quick progress photo. She is coming along nicely, though I really should put her down to work on more of my WIPs. And here is what happens when you stitch with dogs. We have three large ones, and when I stitch outside in the evenings they like to sit right next to me with their head over my shoulders. This is the coveted spot in our house. So do you see the little spot to the left of my stitching? Wanna guess what that is? It's dog drool! Yuck yuck yuck! 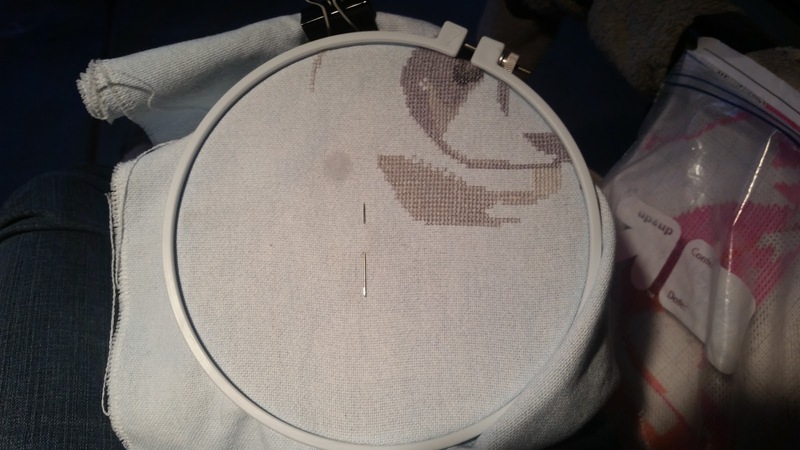 I set my stitching down on my lap for a second and turned to mark off the chart, and when I picked it back up found this. 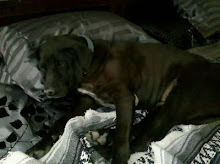 Poor Ashley, so far she has been subjected to coffee and dog drool, what's next! I shouldn't jinx myself. So tonight I officially reached my 1st quarter WIP goal for 2017. 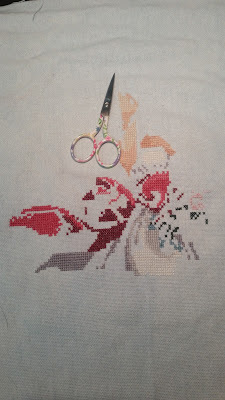 I have completed 9 WIPs in the first 3 months, putting the final stitches in the final two just last night. And with three days left in the month too, not to brag or anything! Lately Ashley has taken up all my stitching time, and led my wandering eyes away from the goal. 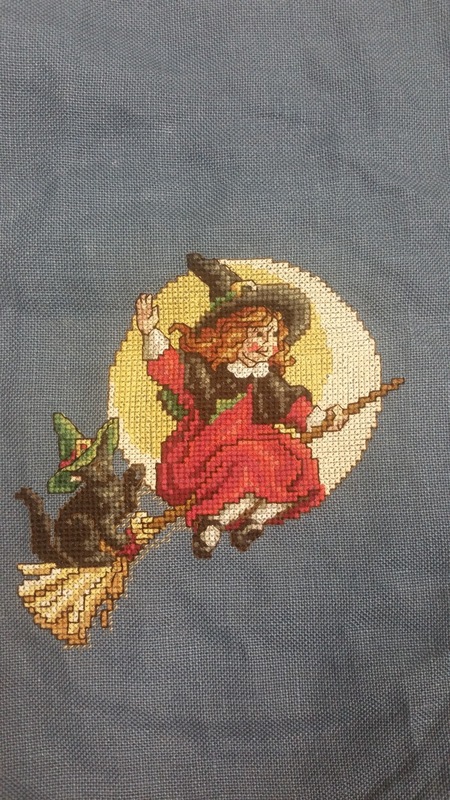 The little red witch above is from the "Autumn Sampler", a Janlynn Kit that is also on my WIP list. But I liked her so much, I wanted to do a smaller ornament of just her. There was a ton of back-stitching left to do on her. I am not quite thrilled with the little black cats face, but I am going to let it go and move her out of my stitching basket. 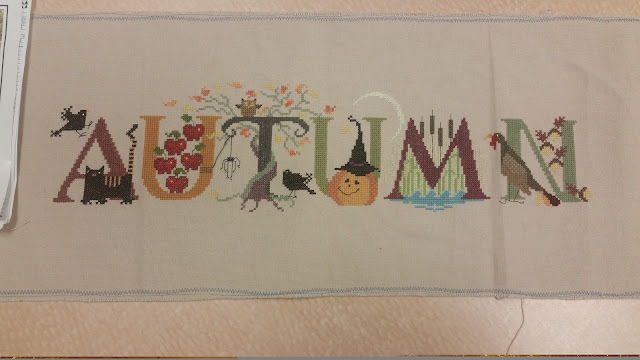 And here is my second finish, "Autumn" by Cricket Collection. All I needed to get done on this one was the apple and cat-tail stems, and the eyes of all the little critters. Why do I let projects like this languish in my WIP pile for so long, when it literally took me twenty minutes to get this done. I love the crows and the jack-o'lantern on this one, and may make a smaller ornament out of just them later on. 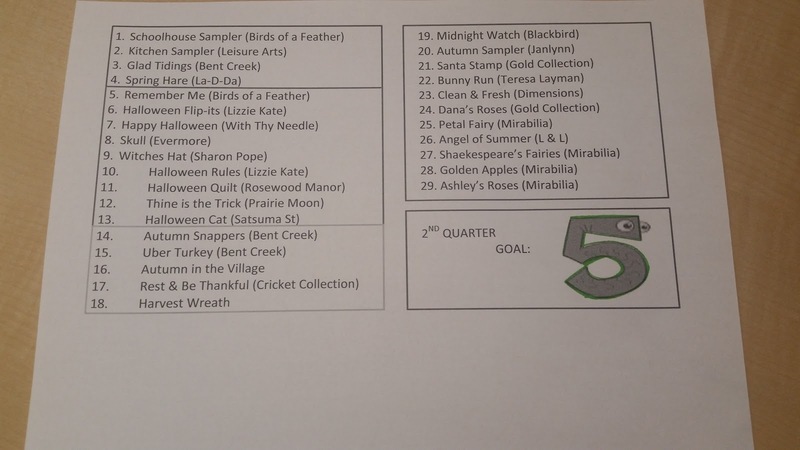 And in honor of meeting my stitching goal, I went ahead and prepped my list for the next three months. 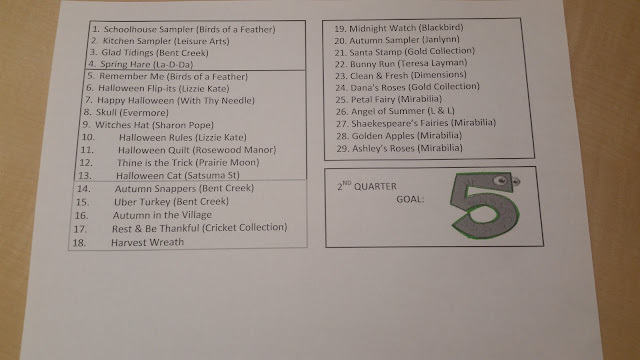 I have gone from 51 projects total to just 29. I organize them by theme, the top box is miscellaneous, the second box is Halloween projects, the third is Fall themed projects, and the box on the right hand side is all of my BIG projects. So my goal for the next three months is 5 more WIPs done, or about two a month. How easy is that? Now if only I can keep myself from adding any new WIPs to the list. Wish me luck! Thank you to everyone who posed an answer on what a bell ringer was in my last post. All of your answers made sense, and I can now say I learned a new phrase from an otherwise pretty easy book. 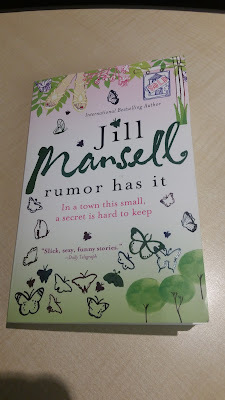 Some months I like to read horror or crime novels, and some months all I can handle is easy fluff books. Above is my progress on Ashley. I have the worst time getting a good photo of her! 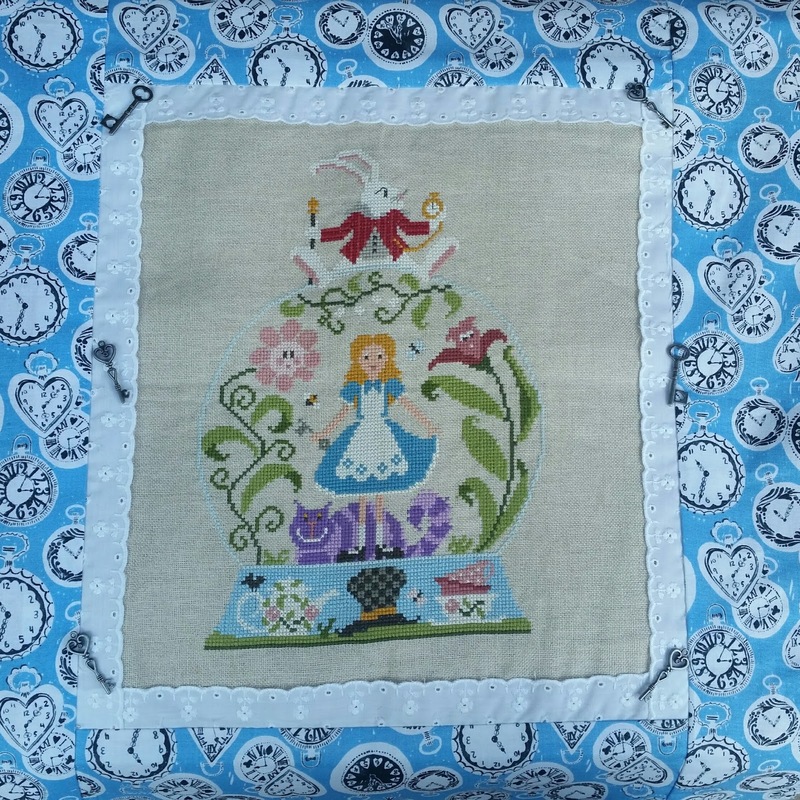 The fabric is hand-dyed by me, using a RIT dye called Kentucky Sky, and it is the prettiest shade of light blue. But does it show up at all in any of my photos? No, it just looks like a yucky grey. I need to take her outside in the full sunlight to see if I can really get a good picture of how bright and cheery she is. It probably doesn't help that I am using my cell phone for photos instead of an actual camera, I may have to dig out my camera to get a true to color picture of her. 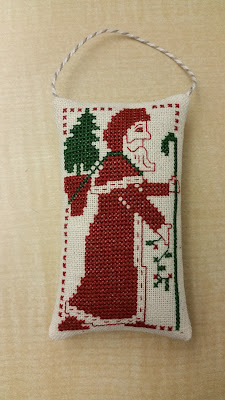 And here is the ornament I received from Carol on the Hooked on Exchanging blog. Obviously a Prairie Schooler Santa, I love the simplicity of their designs. I managed to mail mine out last week, and can't wait to show what I stitched here. 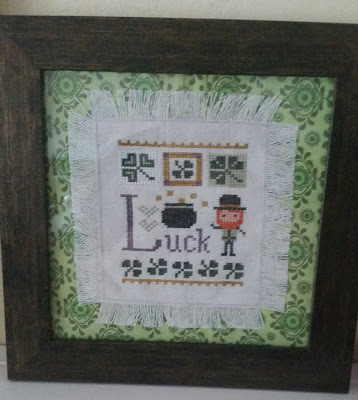 That is my favorite part of doing exchanges, hoping the person I am stitching for loves what I stitched as much as I did. Last week was my birthday (I won't scare you with how old I am- or how old I feel), and my DH and middle daughter picked out the most beautiful bouquet. My daughter called them tangerine tulips. The blooms went from almost a coral color on the bottom to pink and yellow on the tips. So pretty! 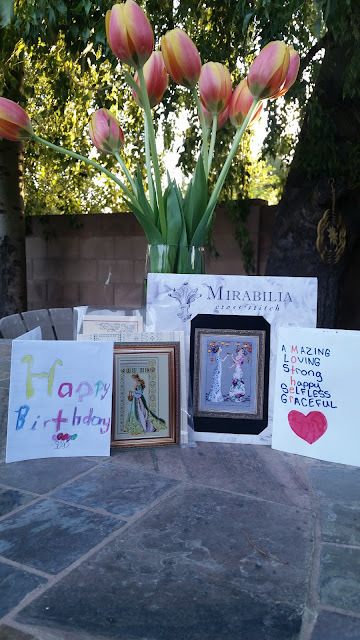 Each of my daughters made me a birthday card, and DH picked out two new charts from my wish list. Mirabilia "Garden Party" and Lavender & Lace "Celtic Summer". I can't wait to get started stitching on both of these, but I am still trying to be strong and finish off more of my WIP list. 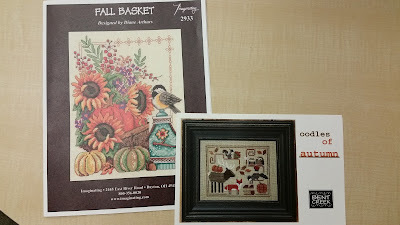 And here is a little stash I picked up for myself, a new Bent Creek- Oodles of Autumn. I loved the little fox and raccoon and you all know how much I love anything fall of course! 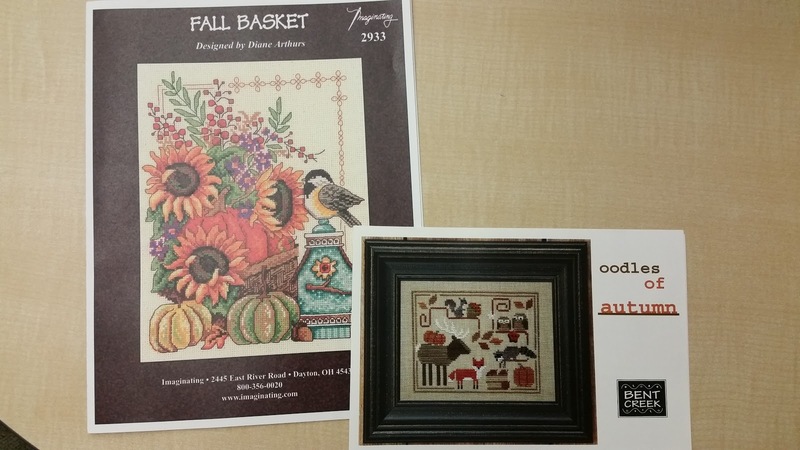 Also Fall Basket by Imaginating. I just finished off their Harvest Lantern design earlier this year. The colors on this one, between the turquoise bird house and the purple flowers and golden sunflowers are so pretty! Had a little time this weekend to do some finishing. I worked on my HOE ornaments (eek everyone else has their ornaments mailed out already-I am of course the slow one) so I can't show those yet. 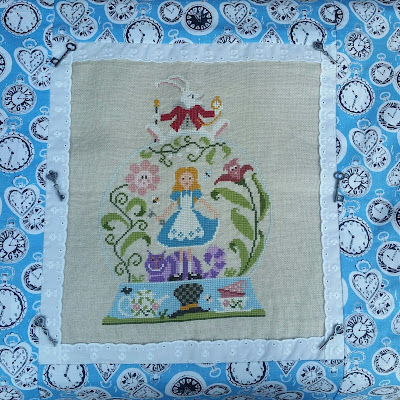 But I also did some fussing with Alice. I found the little keys in the dollar bins at Michael's and wanted to do a border of black and white beads around the white trim. Unfortunately the trim, combined with the linen and the fabric is super hard to stitch through so the beading didn't work. So now I am letting it sit for a while hoping inspiration will strike me for how to finish it off. 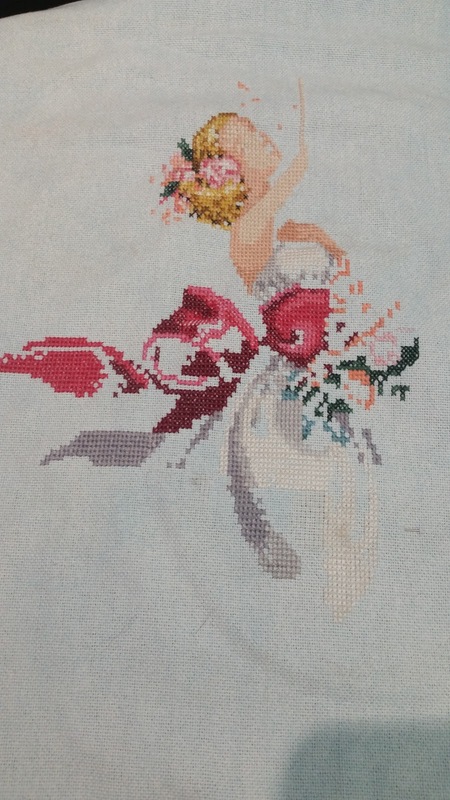 A tiny bit of progress on Ashley, I worked mostly on her bouquet last night which was very slow stitching. 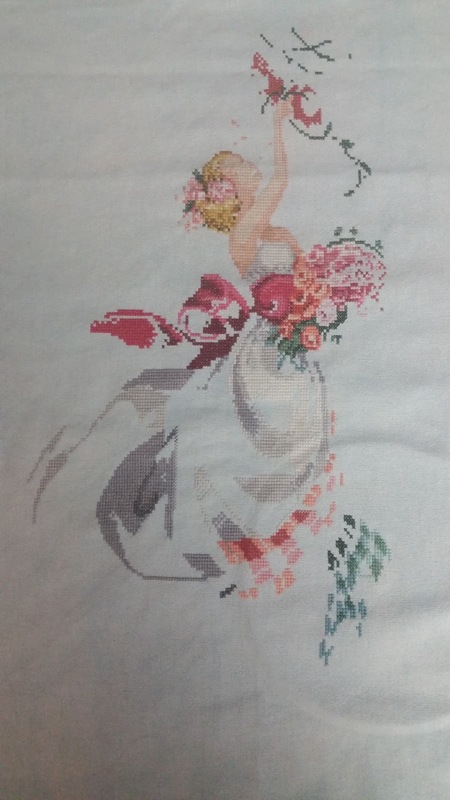 There must be over a dozen different shades of pink in the flowers, so much confetti stitching! At least the pinks are pretty I guess. "And he completely forgot to mention the bell-ringing. -- How could I have gone out with someone for six months and not known they were a secret bell-ringer?" So I googled bell ringing and it of course gave me the obvious answer of someone who rings a bell, but it was such a weird phrase, anyone out there with a better answer than google? Happy first day of Spring, though here it is starting to feel like summer. It has been in the low 90's here in Arizona, which is too hot for me. All of my children have been asking when the pool will be warm enough to swim in, and I had to let them dip their toes in to prove it was not warm enough yet. Ashley is coming along, gathering roses for the spring-time. I have decided to do all of the grey in her dress first, and all of the white of her dress last to try and keep it as clean as possible. I'm sure I will regret this choice when I am going blind from all that white. I have to share how well my husband knows me. I ran in the kitchen the other day and frantically put her under the cold tap after spilling coffee on her (EEK!) and my husband asked which piece it was. When I said it was my Mirabilia he had the good sense to say "Oh no! Not that one". Luckily it was only a few drops of coffee and a quick rinse under the cold water did the trick. 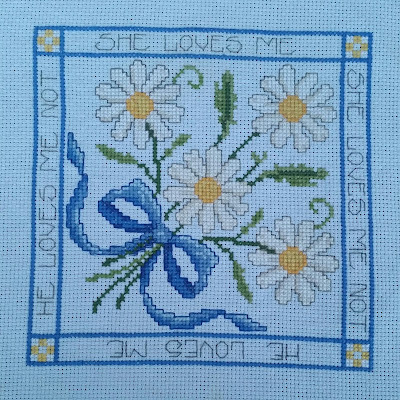 Silly me stitching before I have finished my morning coffee. Here is how we spent this warm weekend. 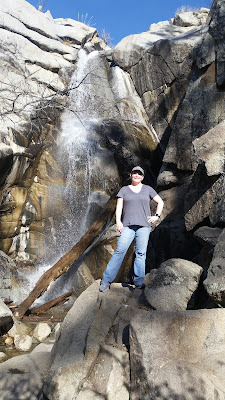 We drove up north for a little hiking, and to see this beautiful waterfall. It was really flowing with the snow-melt from up north. 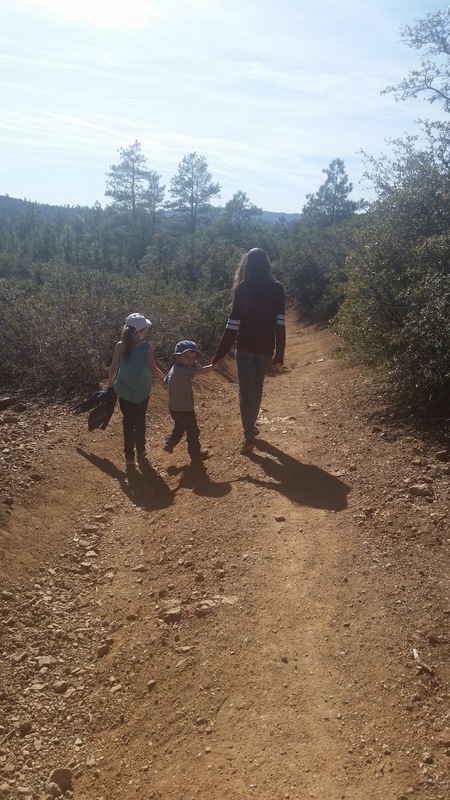 Our little one was convinced we were in the woods looking for bears, wolves, or snakes. Luckily none were to be found along our little hike, just a very pretty herd of deer (who did not seem the least concerned with us). My fitbit said we had climbed 50 floors on the hike and went a bit under 3 miles along the trail. I would like to note also that I carried the littlest one most of the way back up the trail after he exhausted himself playing by the waterfall, and I could definitely feel it in my back and calves today. Made me feel like all those mornings at the gym were paying off. 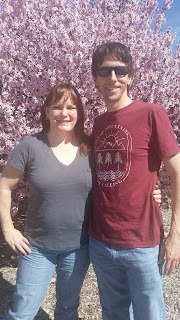 And below is pre-hike, I made my husband pull over so we would get a picture in front of the cherry trees. Prescott has a few streets of beautiful old houses, and each block was lined with these trees full of pink and white blossoms. Forgive me, not the most original title-but it's early and the caffeine hasn't kicked in yet. 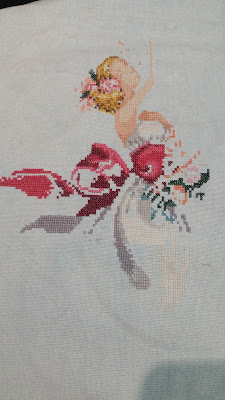 Still stitching along on Ashley's Roses. 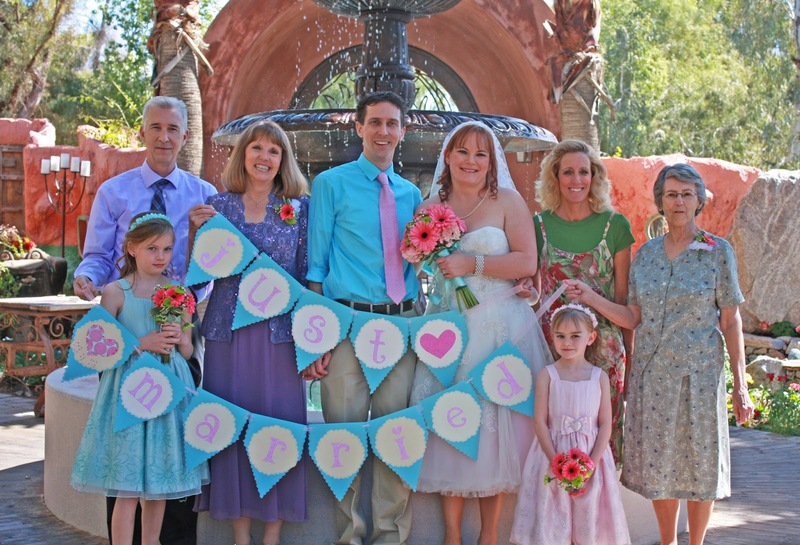 Lots of white in her dress, which is not as bad as the confetti of pinks in her bouquet and her hair. Darn all that pink is so pretty once it's done though! Christina of Whilst Iris Naps commented about having to look up what she would look like finished. She is an older Mirabilia design (1998) and I do have the original chart but it was missing the photo so i'm sorry I can't show you what she will look like here. How I came to purchase the chart is actually a funny story. I bought this chart, and about 20 other Mirabilia's off of a Craigslist post of a sad looking box of patterns and a tangle of thread. Well, when I got to the house it was a man selling off his mother's stash who had unfortunately passed away. 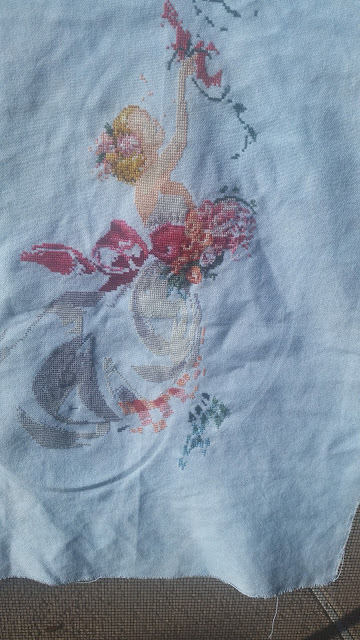 He showed me the box that was in the original posting on CL of mostly patterns from the 80's and old magazines that I wasn't sure I would find anything to stitch out of. 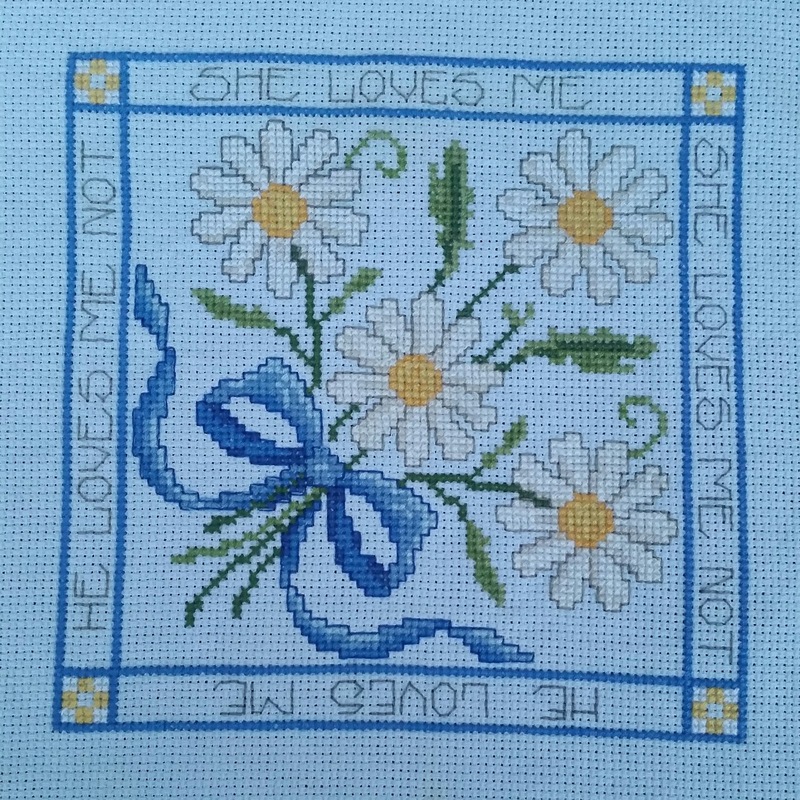 He then asked if I cross stitched, and if I would be interested in seeing the other stitching stuff she had. He hauled out this big steamer trunk, full of her half stitched projects, some in bags with charts/threads, and some just tossed in randomly. Then he brought out two other cardboard boxes with a folder full of Mirabilia patterns, another full of Teresa Wentzler, and several others beautiful patterns. From the first look in the boxes, I was almost hopping up and down with excitement. I bought the whole lot up, and could barely fit it all in my husband's Jeep. 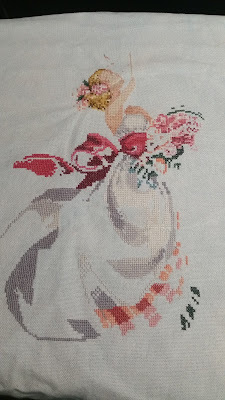 Now I worry if I will ever do her half-done projects justice, she had many that were half started and I can't imagine how many hours of love went into each. 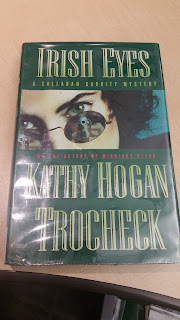 Here is my new reading start this week. I have talked about how much I love Mary Kay Andrews books, and this is her writing mysteries under a different name. We shall see if it measures up to her more romancey types books. We also did some Netflix watching this week. Finally got to see The Reader with Kate Winslet. You may remember I just got around to reading the book in January. I must say the movie was just as good as the book. Kate Winslet and Ralph Fiennes really did their characters justice. Another movie we watched that I can highly recommend is the Accountant starring Ben Afleck. I really liked him in The Town, and this again is another action movie. The story though was interesting, and not the typical car-chase shoot em up action movie. 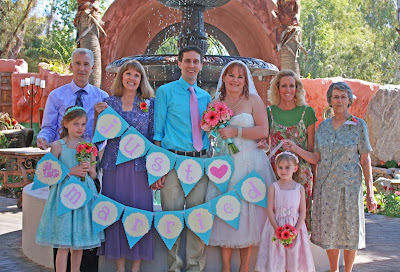 And this weekend was my sweet husband's and I's fourth anniversary. My girls look so young in the above photo. I'd like to say we don't look too much older yet, but the years (and wrinkles) do sneak up on you. For our anniversary we had a wonderful date night with grandpa babysitting our little guy at home. We did a couples massage (a first for my husband) and then went out to dinner at the Melting Pot, a fondue restaurant (which was a first for me). And here is my 6th finish for the year. This WIP was sooo old, I started it 13 years ago I think! The Aida I stitched it on was so grimy too, but with a good rinsing in some soapy water it now looks clean again, This is a pattern out of a magazine, so I am not sure who the designer is. And here is my little bit of March madness. You know how I have been trying so hard to reduce the amount of WIPs I have? 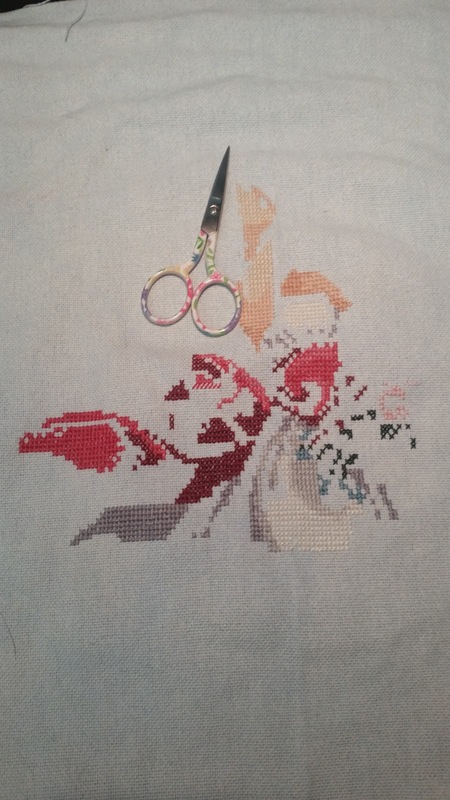 I have been restraining myself to only starting one new project a month (LK Luck was my Feb start and finish). So for March my fingers were itching to start a huge Mirabilia that I have no hope of finishing anytime soon while still trying to show love to all my other WIP's. 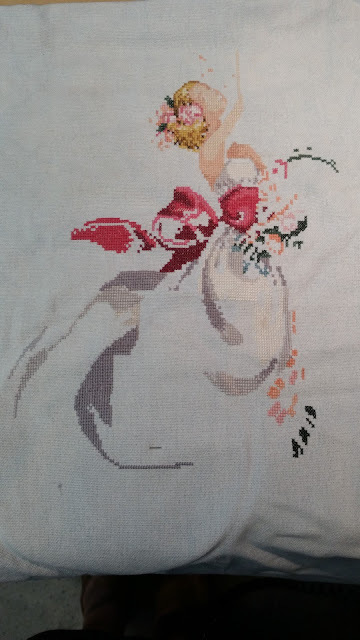 But I just couldn't help myself, so I present to you my start on "Ashley's Roses", and man is she big- 202 by 262 stitches. She is a perfect Spring/Summer stitch to counter all of the Halloween WIPs I am trying to get through. 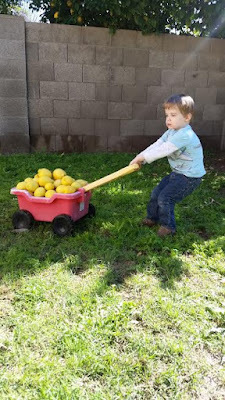 And here is my littlest one helping me pick lemons in the yard. We got a full laundry basket full of lemons off of our neighbor's two trees, and juiced 4 pitchers full of lemon juice. We also planted our tomato garden for spring already, but with all the rain we have been having our little plants are looking a little battered. 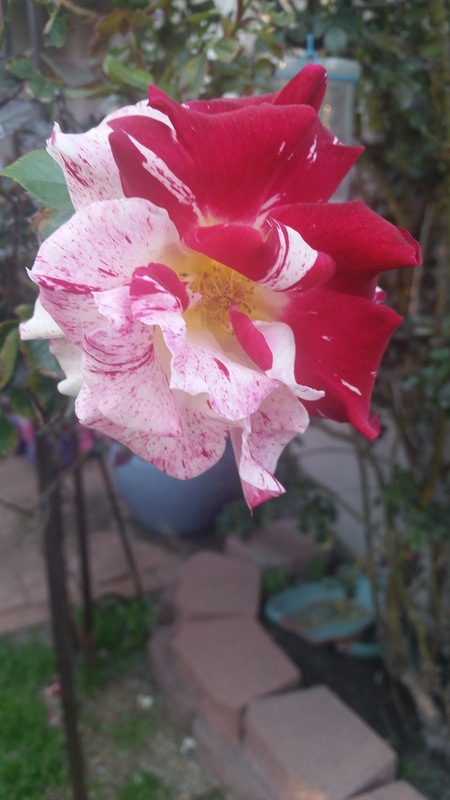 I'll leave you with one of our roses on the trellis outside of our bedroom patio. These are called Fourth of July roses, and I love the white and pink stripes of them. They are not very fragrant, but they do grow nicely over the trellis, this particular bush is up to about 11 feet tall, and puts out blooms for much of the year.